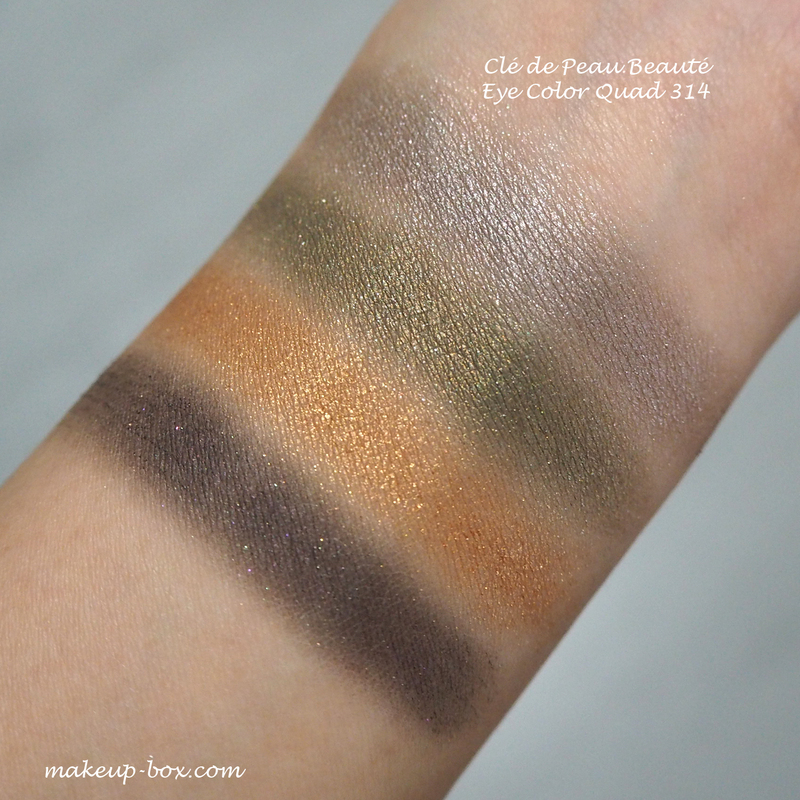 Clé de Peau Beauté always does beautiful holiday collections. This year's Collection Bal Masqué is a take on mysterious glamour with lush velvet colors accented to burnished metals. Think burgundy, red, olive, gunmetal silver, and gold. I can just swatch it - but it's always better if I can do an entire look to show you how everything goes together. It's quite a full-on look - you need to be comfortable with wearing smoky eye shades with Extra Rich Lipstick in that beautiful blue-based red, No 314. Then again, you can always wear them separately or go easy on the shadows and wear them with a light hand. But this is the time of year when I think you can stop worrying so much about being "too glammed up" and just go for it. The other star product from the collection is the Body Powder. 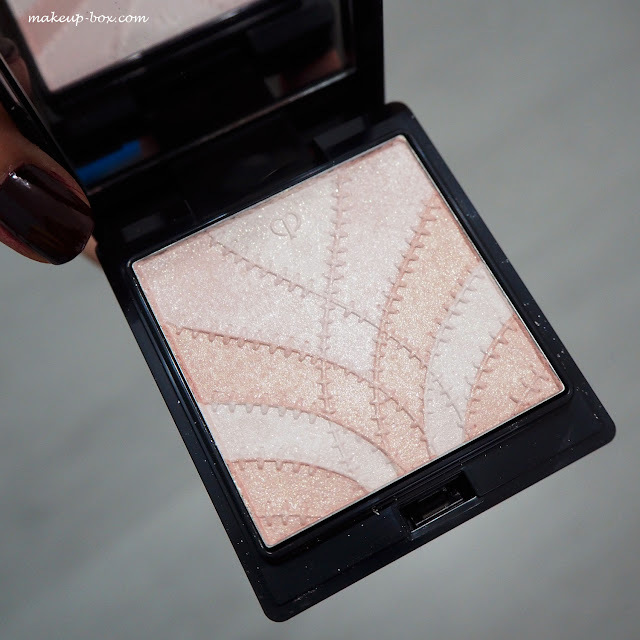 I was surprised to see the name because I'd instantly thought - cheek highlighter! But once you swatch it you realize why. 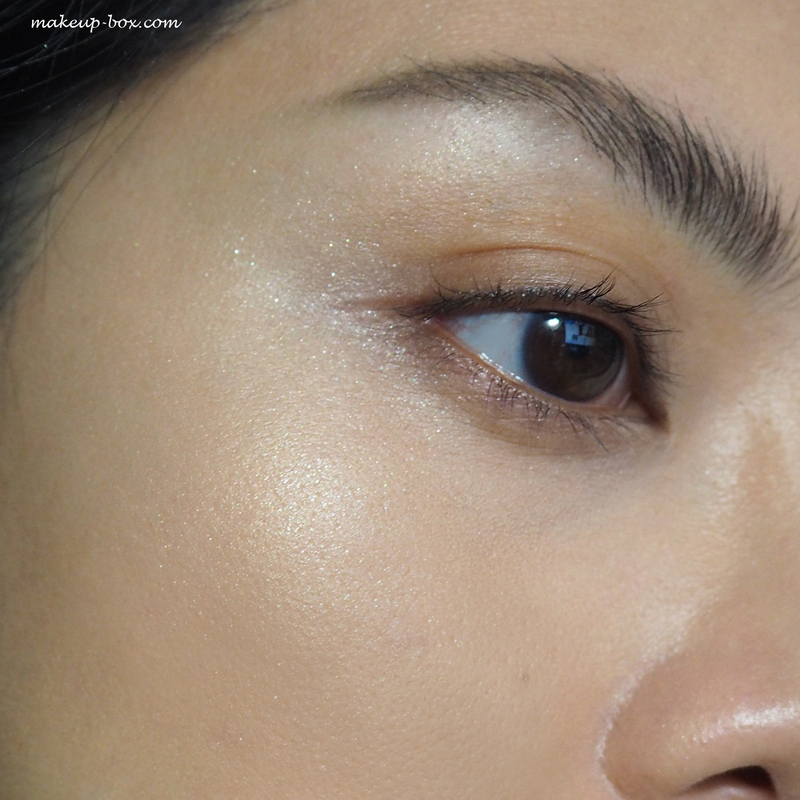 There are obvious specks of micro-glitter running through the powder, so it won't work as a daily highlighter for a dewy/glowy look. This is a party powder. From a distance it looks like strobed skin, but up close you will see all the glitter particles. That's why I consider it a special occasion powder if you want to use it on your face. And avoid the inner cheeks because it can emphasize pores. On the collarbones, shoulders and arms this would also be gorgeous of course. 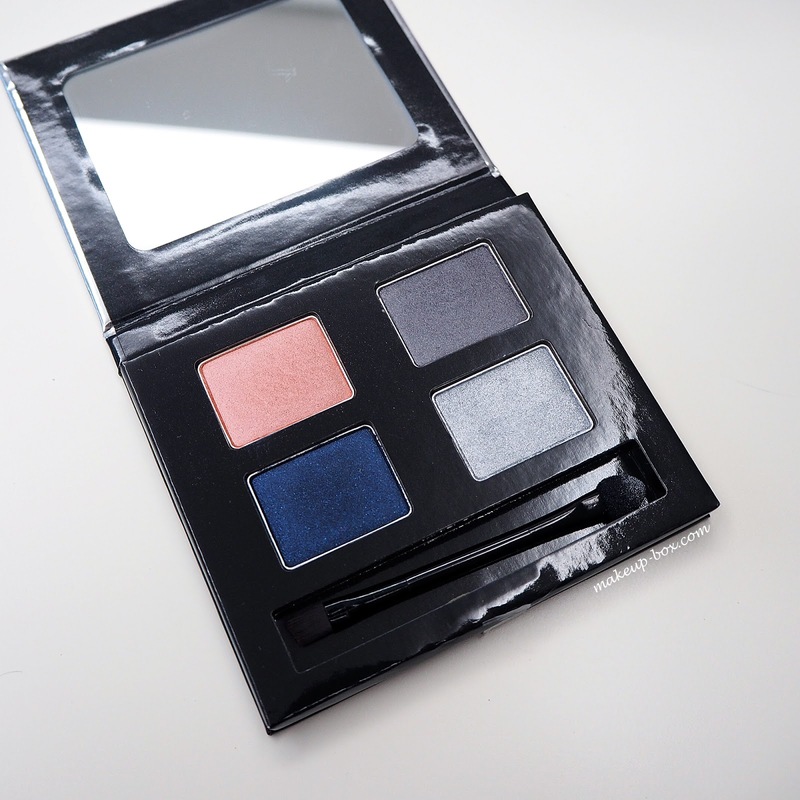 And I have to say - that compact is just unbelievably gorgeous. I know fans who buy it simply to collect. 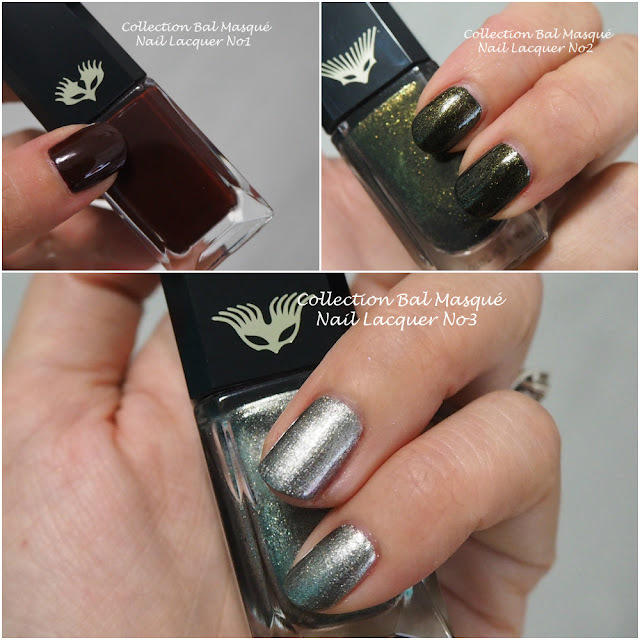 Too coordinate with the makeup, there is a trio if nail lacquers that come in a set. The formula is ultra-smooth and you can get away with wearing a single coat if you are in a hurry because they go on so pigmented. I was not expected that dark scarab-green metallic (No 2) to be my favorite but it's beautiful. Whether you're into bath and body products or not, you have to hand it to The Body Shop for great holiday makeup. 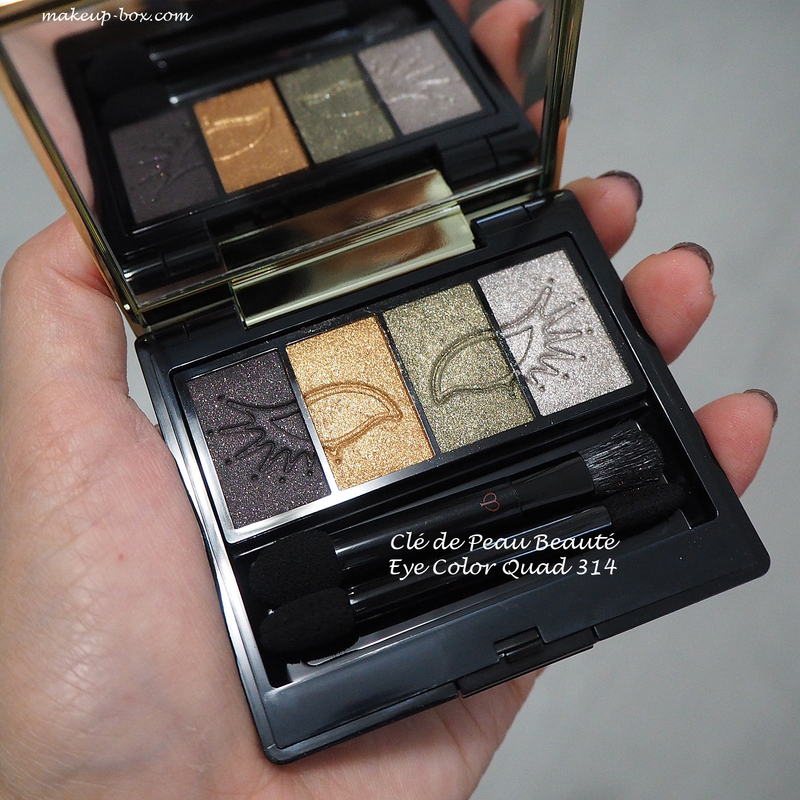 I'm quite a fan of their eye-shadows which were reformulated about 2-3 years back. And Christmas is the season where they come up with annual limited edition eyeshadow quads that are perfect for the party season, and won't break the bank. If you're not sure how to use the shades, there are instructions and a diagram on the back of the package. 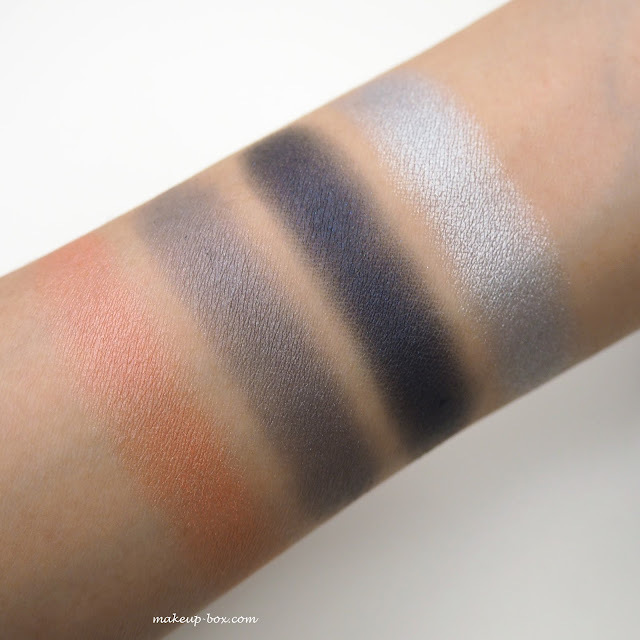 I received the Singing Silver eye palette (below) for review, and had to immediately dig in when I touched the shadows. This is a cool-toned palette, but there is a little warmth (a peach pink) to add some soft, prettiness, and also prevents the look for being too harsh and cool. You get a warm peach pink, a soft grey, a blackened navy and an aluminium silver. The swatches are done with fingers, but the eye look is done with brushes, so you can see the quality is pretty consistent. If I have to nit-pick, I would say the grey shade has a bit more fallout than the rest, and as is normal for most brands and formulas, the dark black-navy tends to come off more like charcoal than blue when applied sheer with a brush. But these are slight, and not major problems. Tip: To get the deep sapphire blue tones to come out more, I would apply with a brush and blend first, then as a last step, dab on a little extra navy with a clean finger to intensify the color. 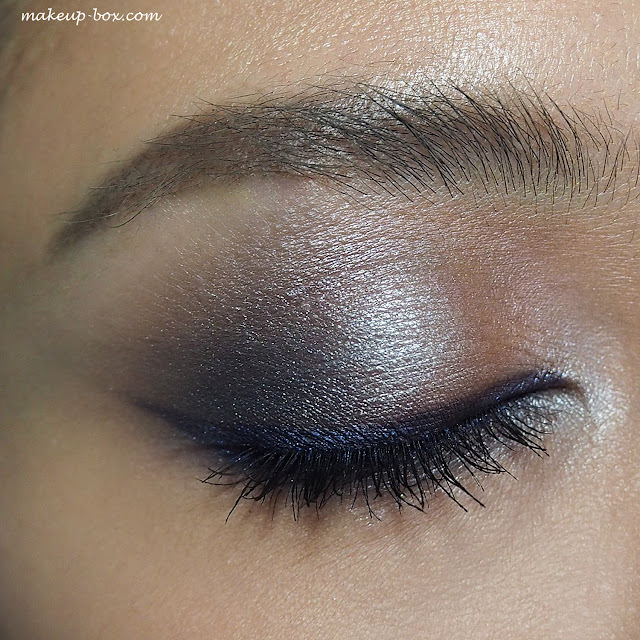 But if you prefer a more neutral look, just use a brush and it will look like a smoky charcoal tone. But really, the quality is great overall, and the peach and silver are fantastic. The best part for me is probably the versatility. The peach shade itself can be used as a warm transition color in the socket if you have pale to medium skin. You can wear the peach and grey for a simple warm-neutral day look, just the navy and silver for a dramatic night look, or skip the peach if you want a very cool-toned Rock'n'Roll smoky eye with cool greys and blues. The packaging is no-frills. 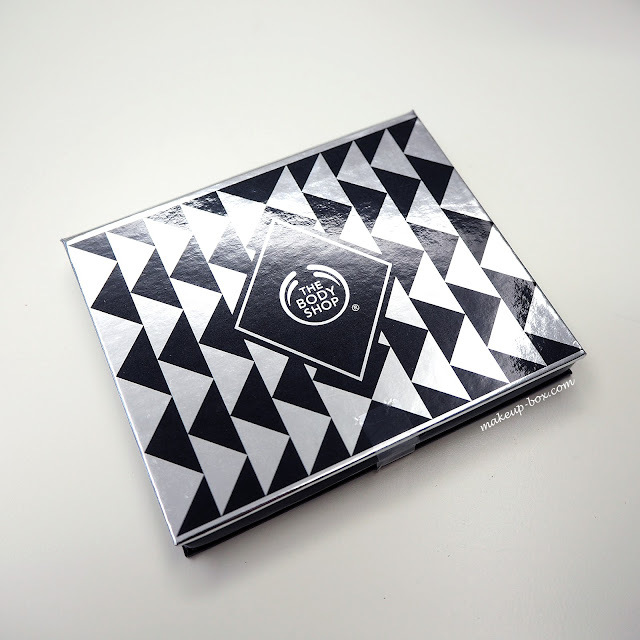 Eco-friendly cardboard that won't weigh down your makeup bag. 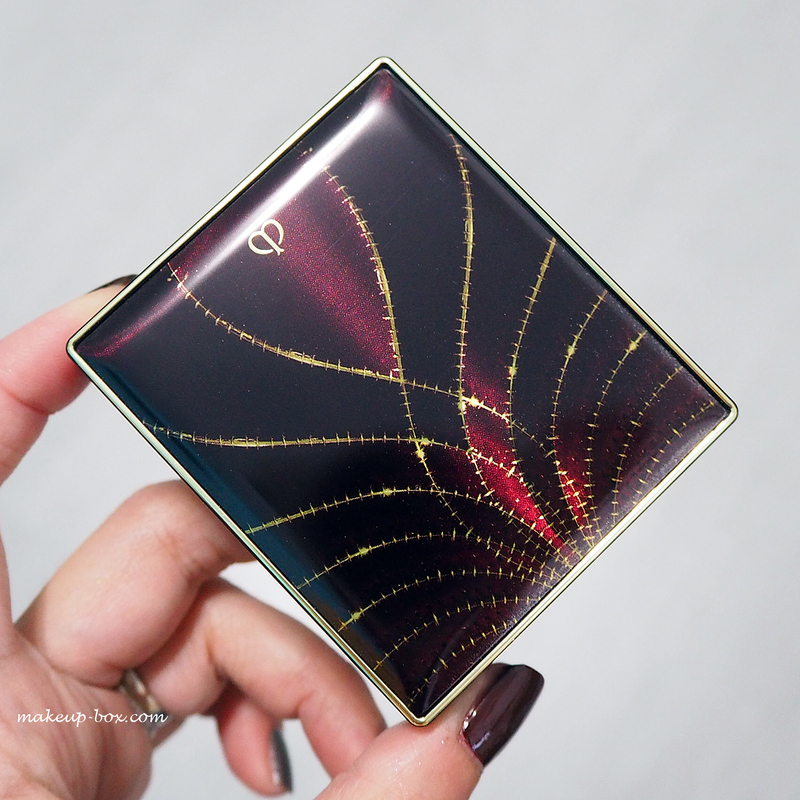 If you care about luxe packaging this won't be for you - but as a reasonably-priced gift for someone who just wants good quality makeup or step out of their neutral comfort zone and try different colors for the holidays, I recommend checking this palette out. I used a metallic navy pencil from Urban Decay to accent the lash line, then used the sponge tip in the palette to run the navy shadow over the pencil. This sets the pencil and brings out more of the navy blue in the look. 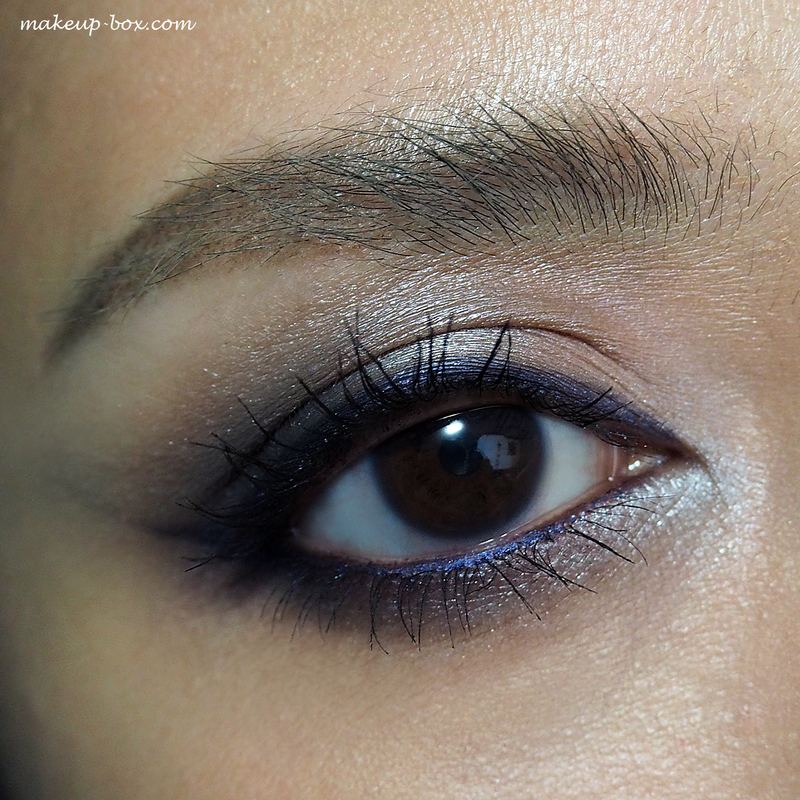 You can use any other navy liner you own. Or stick with black for a more neutral look. P.S. aside from the makeup, I do want to quickly show some products from the Frosted Plum body range as well because I really liked the scent a lot more than I would have expected. It is juicy and fruity, but also quite perfume-y and quite grown-up; you won't smell like candy or a can of juice if you know what I mean. I wouldn't call it "fine fragrance" but if you enjoy fun girly scents from Bath and Body Works, Victoria's Secret etc, this would be perfect for you. The range includes full-size body products like body butters and shower gels, but there are also fizzy bath melts and a shimmering perfumed body spray to "frost" your skin. But the cutest thing is probably the Frosted Plum Feel Good Tin. This big metallic reusable purple tin contains mini sizes of the shower gel, lotion, body butter, scrub, and lip balm. Perfect for sampling the full range - or for making someone's eyes pop out when you gift it to them. Chanel No 5... My Kinda Snow Globe! Can it get any more adorable than this? 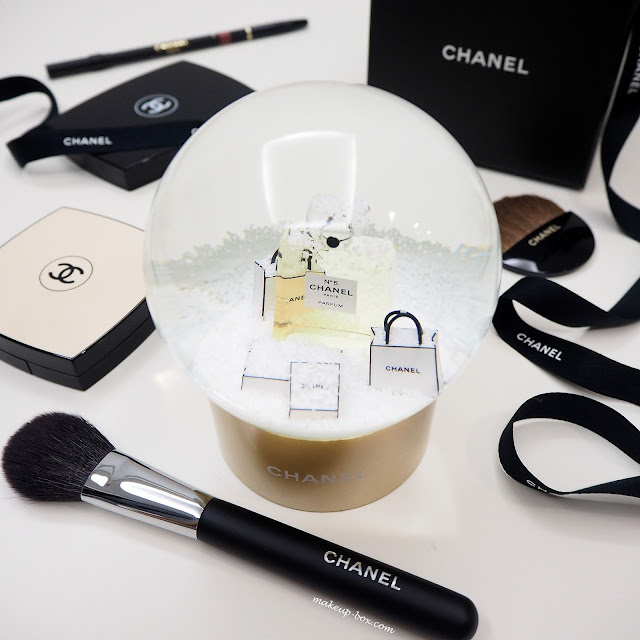 Chanel Beauty is giving away a limited quantity of gorgeous No 5 parfum snow globes to VIP customers in Singapore this year; if you are a regular and received the latest holiday mailer from them, don't just chuck it out - there's a little invitation inside with instructions to redeem a holiday gift, and you need that invite in order to get this lovely thing. 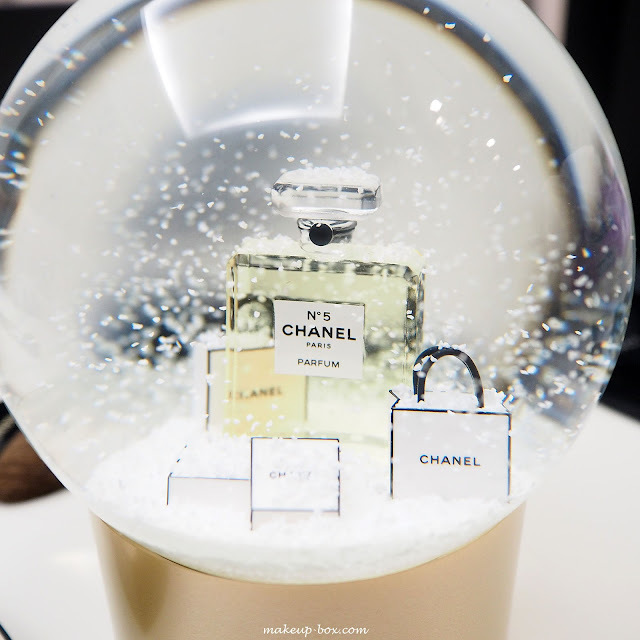 I haven't been into snow globes since I grew past the age of about 8 but how's this for a great conversation piece when guests come over during the festive season? 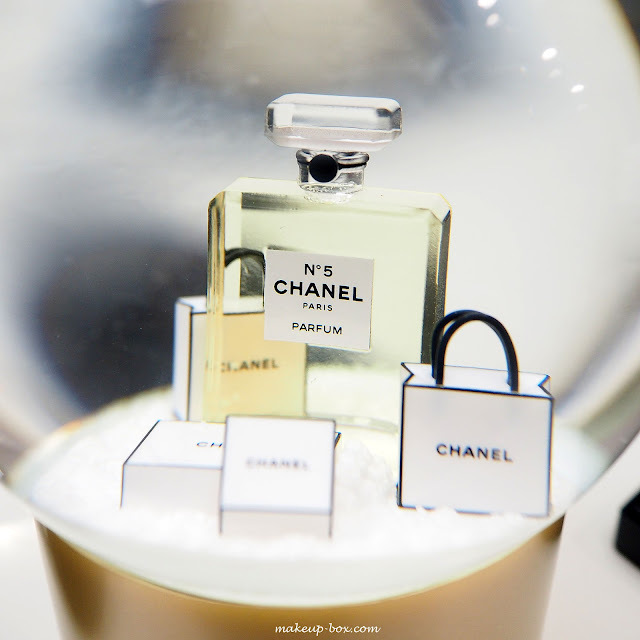 And it's fitting, because a century ago, perfumer Ernest Beaux had wanted to capture the scent of fresh snow when he created the aldehydic top notes which would later be used in Chanel No 5. The rest, as they say, is history. As a teen this was the very first proper perfume that I ever noticed. I had a tiny little tester vial which I treasured and would dab on to feel oh-so-grown-up and sophisticated. Strange, because I had almost no exposure to perfumes then and "Chanel" meant nothing to me. Somehow - even then - it smelt beautiful and womanly to me. I was on holiday in a Winter climate when I first smelt it as young girl, and I've always associated the scent with cold weather and holidays since. It's not something I wear often these days - but I still appreciate its history and the nostalgia.